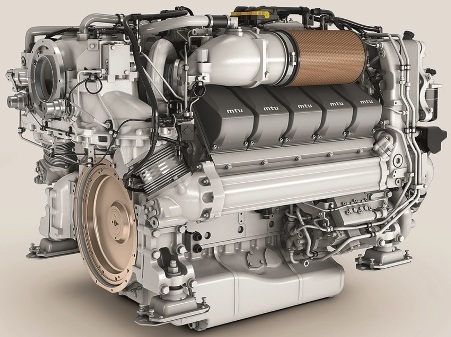 MTU present the new ten cylinder version of the Series 2000 M96 engine. The new yacht engine was seen for the first time at the Cannes show. This new offer is a new ten cylinder version with outputs above 1361hp. It is an ideal extension to our yacht engine portfolio, and should follow on the success of the 12V and 16V models. The new MTU 10V2000 M96 1361hp engine meets U.S. EPA Marine Tier 3 Recreational standards in addition to EU Directive RCD II for leisure craft, which becomes mandatory from January 2017, and features outstanding acceleration behavior and low fuel consumption. The Series 2000 yacht engines are a preferred choice of shipyards throughout Europe: to date, over 16,000 Series 2000 engines have been sold for marine applications.